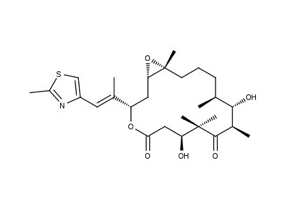 Epothilone B is a bioactive microtubule-stabilizing small molecule. This blood-brain barrier permeable coumpound belongs to the most popular potent cytoskeletal modeling molecules for in vitro cell based assays (see the previous post dedicated to “5 Cytoskeletal Modeling Molecules“). Recently, Ruschel J. et al. have demonstrated that its delayed systemic administration in rodents promoted axonal regeneration with Central Nervous System (CNS) injuries. These findings open new therapeutic areas regarding the use of microtubule-stabilizing drug compounds, like Epothilones, in CNS recovery and neuroregeneration. Ruschel J. et al. “Systemic administration of epothilone B promotes axon regeneration after spinal cord injury” (2015) Science 17 April 2015: Vol. 348 no. 6232 pp. 347-352, DOI: 10.1126/science.aaa2958. In addition to Epothilone B, various small molecules active on microtules are available for research applications. Neuropathiazol is known to act on neuronal differentiation of multipotent hippocampal neural progenitor cells while suppressing astrogliogenesis. P7C3 has proneurogenic activity by protecting neurons from apoptosis. Neurodazine induces neurogenesis of non-pluripotent myoblasts and cells derived from skeletal muscle and upregulate genes involved in neurogenesis. The neurogenic differentiation inducer, ISX9, enhances proliferation and differentiation of hippocampal subgranular zone neuroblasts. It blocks malignant astrocyte proliferation while downregulating their astrocyte character, inducing reentry into the cell cycle and upregulating neuronal gene expression. I’d like to thank our friends at Focus Biomolecules for helping me in editing this post !